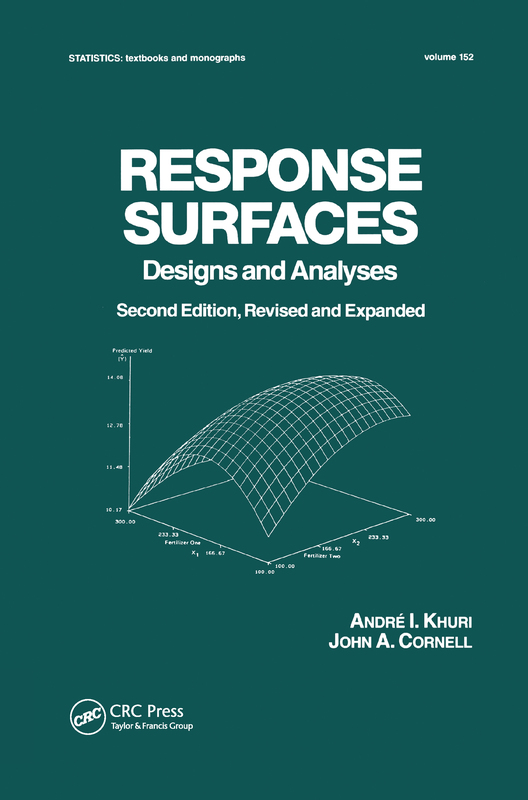 Response Surfaces: Designs and Analyses; Second Edition presents techniques for designing experiments that yield adequate and reliable measurements of one or several responses of interest, fitting and testing the suitability of empirical models used for acquiring information from the experiments, and for utilizing the experimental results to make decisions concerning the system under investigation. This edition contains chapters on response surface models with block effects and on Taguchi's robust parameter design, additional details on transformation of response variable, more material on modified ridge analysis, and new design criteria, including rotatability for multiresponse experiments. It also presents an innovative technique for displaying correlation among several response. Numerical examples throughout the book plus exercises--with worked solutions to selected problems--complement the text. Xb. It is important to distinguish between the error s. in Y. with respect to the corresponding true value, Y. = + e., and the residual r. of Y. with respect the predicted value "f'(x.). The individual residuals are used for checking how close the proposed model fits the data values as well as for checking the nor- mality, independence, and constant variance assumptions of the errors. of Y(x) and the average squared in Eq. 6.7. of the region a distance of V3/5. .E. Criterion for Constructing Response Surface Designs, Commun. Statist. of each column of the second matrix term on the right-hand of Eq. 7.37 are the means of them rows of C, the N columns of this matrix if if of C are identical, that is, if and only if c"